2019 is off to a nasty start thanks to a big revenue guidance cut from Apple (NASDAQ:AAPL) as iPhone demand continues to wane. Looks like only making marginal updates to a $1,000 cellphone wasn’t such a good idea. As a result, shares of the one-time momentum sweetheart are down over 8%, collapsing back to levels not seen since early 2017. This caps a near-40% decline for the stock from the highs set in early October and puts the stock on track for its worst one-day loss in five years. 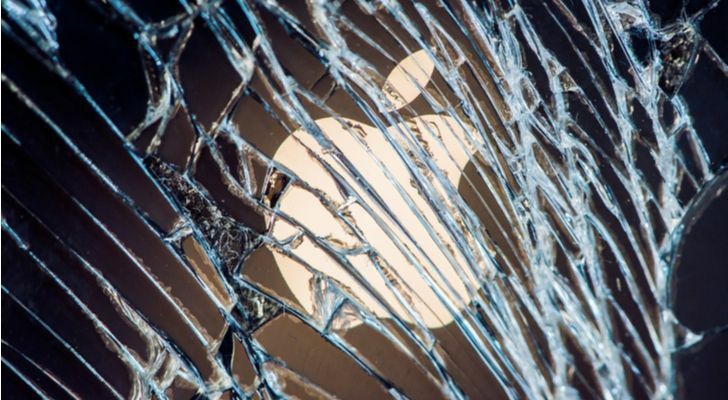 This is the single most covered stock in the world, and analysts were blindsided by the decay of the smartphone dynamic despite months of warnings from Apple suppliers. Apple currently has 26 buy recommendations, 20 holds, and just two sells. Sure, CEO Tim Cook is blaming China for the decline (specifically, the U.S.-China trade tension), but this is a cop-out. If you make an innovative product, Chinese consumers will buy it anyway. 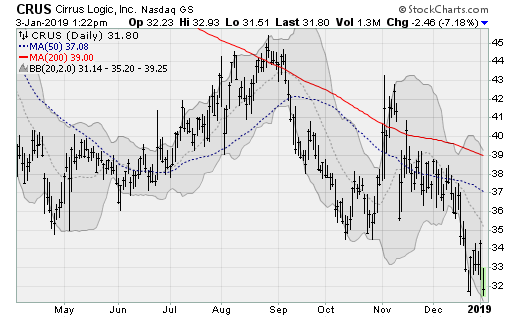 Qualcomm (NASDAQ:QCOM) shares are on the verge of breaking down out of a two-month consolidation range as the price continues to languish below the 50-day and 200-day moving averages. Already down more than 25% from the September high, the company is clinging to critical support near the $54-a-share level as it faces not only a slowdown in the smartphone market but a royalty dispute with Apple. The company will next report results on Feb. 6 after the close. Analysts are looking for earnings of $1.09 per share on revenues of $4.9 billion. When the company last reported on Nov. 7 earnings of 90 cents per share beat estimates by six cents on a 2.1% decline in revenues. Shares of Skyworks (NASDAQ:SWKS) are in full meltdown mode, down another 10% today to cap a decline of more than 30% from the high set in July. This returns it to levels not seen since the summer of 2016. The company makes amplifiers, antenna tuners and other smartphone components. The company will next report results on Feb. 7 after the close. Analysts are looking for earnings of $1.91 per share on revenues of $1 billion. When the company last reported on Nov. 8, earnings of $1.94 beat estimates by two cents on a 2.3% rise in revenues. 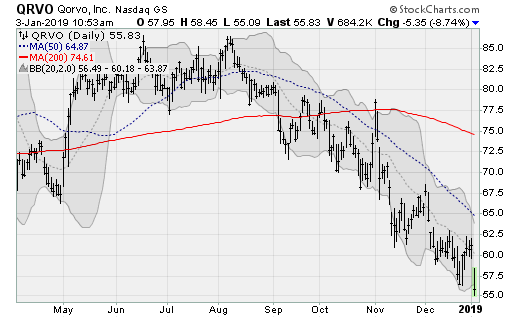 Shares of Qorvo (NASDAQ:QRVO), maker of radio frequency (RF) components that help smartphones connect to cell towers, is also in the midst of an epic slide lower. Losses total nearly 40% from the highs set in early August as prices return to levels not seen since early 2017. Not only does the company face industry-side headwinds, but new competitor Akoustis Technologies (NASDAQ:AKTS) offers a better single-crystal RF filter that offers better performance in a much smaller package. The company will next report results on Jan. 30 after the close. Analysts are looking for earnings of $1.69 per share on revenues of $820 million. When the company last reported on Oct. 31, earnings of $1.75 beat estimates by 13 cents on a 7.8% rise in revenues. 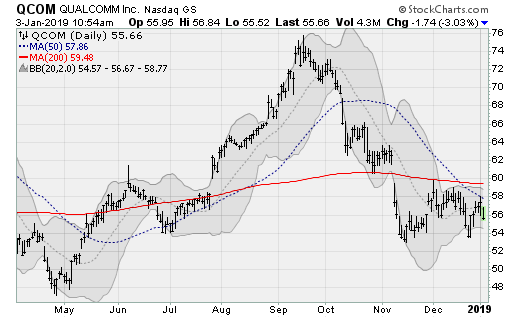 Broadcom (NASDAQ:AVGO) shares are threatening to fall away from multimonth resistance to move back below their 50-day and 200-day moving averages. 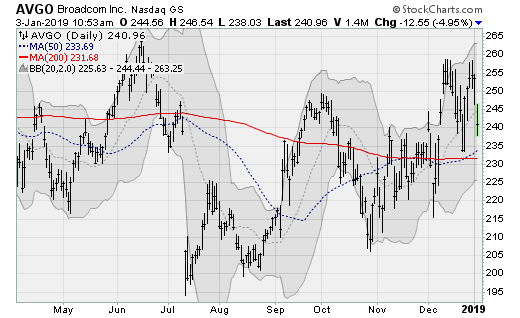 Watch for a return to the late-October low, which would be worth a loss of roughly 13% from here. The company will next report results on March 14 after the close. Analysts are looking for earnings of $5.26 per share on revenues of $5.9 billion. When the company last reported on Dec. 6, earnings of $5.85 per share beat estimates by 27 cents on a 12.4% rise in revenues. 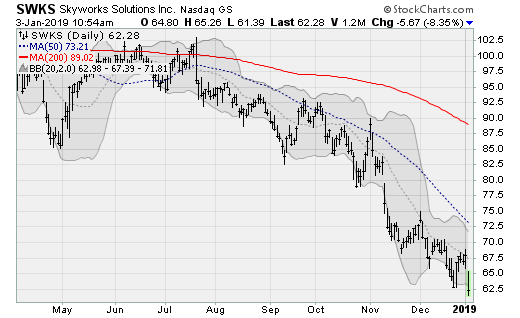 Cirrus Logic (NASDAQ:CRUS) shares are threatening to fall below critical support near $32, capping a loss of nearly 30% from the highs set back in August. Prices have returned to levels last seen in early 2016 as the maker of analog and mixed-signal circuits struggles with tepid handset demand. The company will next report results on Feb. 4 after the close. Analysts are looking for earnings of 78 cents per share on revenues of $319.9 million. When the company last reported on Nov. 1, earnings of $1.08 beat estimates by 34 cents on a 13.9% decline in revenues. Article printed from InvestorPlace Media, https://investorplace.com/2019/01/5-apple-suppliers-hurt-by-apples-guidance-cut/.